“I have no where to put that.” I said to our creative director ten minutes before the service started. I had carefully crafted my outfit to hide the growing baby bump, but I had failed to consider the mic pack. “Just clip it to your waistband.” Sure. They looked like jeans, but they were not. “I can’t. They’re… Um… maternity pants.” He was stunned and confused and then congratulated me. I wanted to crawl into a hole. Add it to the list of one more way being a woman in church leadership is just… different. I do not like gross challenges. I have no preference between Batman or Superman. There is no sports team I feel die-hard loyalty toward. I cannot grow a beard. I do not have a smoking hot wife. I entered ministry in 2007–not long ago, but long enough that women-in-ministry was still a relatively unsupported arena. Stepping into this arena, there were challenges I knew I’d face. But I thought: I can go toe-to-toe theologically. I know the scripture and I know my gifting. Finding my identity as a youth pastor, however, proved not as easy. I had the privilege of learning under gifted leaders, whom I remain incredibly thankful for. The problem was- they were all men in a man’s field. All of them fiercely championed my calling but navigating what it meant to actually live in this space was a task I wrestled through quite alone. For a while I fought for sameness. I could learn the lingo for sports and superheros. Like a pair of too tight shoes, I wobbled around clearly uncomfortable trying to make something work. I fooled exactly no one. 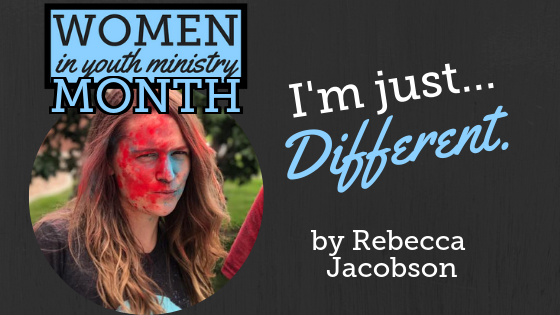 It was a freeing moment to realize that God called me into ministry, knowing every ounce of me — knowing the nerdy and dorky, knowing the areas I was more feminine and where I was more aggressive. God knew every molecule of my DNA and didn’t wish I was more of this or less of that. God knew full well who he created me to be and placed the call on my life. He knew the exact students who needed exactly me- not someone else or the person I was pretending to be. My male mentors never prepared me for when one of my kids asked about my mucus plug or when another almost drank my breast milk from the staff fridge. They didn’t prepare my husband for the odd world of being a pastor’s husband- one with little support or understanding. They didn’t prepare me for navigating motherhood and ministry- an experience fundamentally different than fatherhood and ministry. I am thankful to now know many female spiritual powerhouses. Women who so clearly have the anointing of God. Women who helped showed me that I am enough and I hope that message is loud and clear to you, too. I pray for you, wherever you are, in whatever season you would rest so securely in your identity as a daughter of the King. I am thankful to be a part of a tribe to navigate this journey together. Cheers, friends.